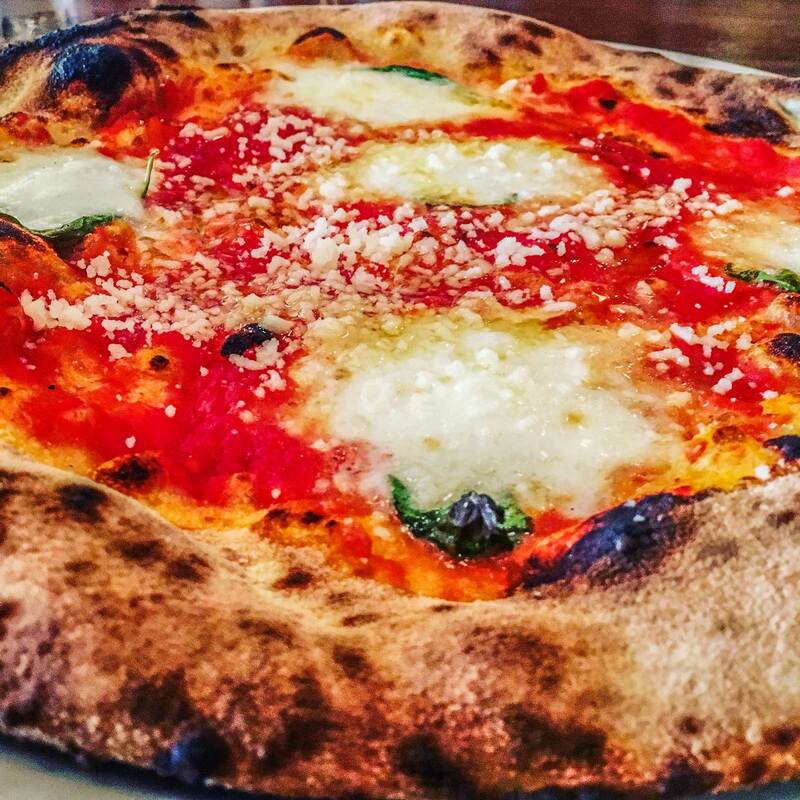 The name “Brooklyn” is synonymous with pizza and there are plenty of places both old and new to pick from. For a taste of the new (since 2004), Franny’s is just one block south of the 7 Av station on Flatbush Ave. Their simple is best, less is more approach to Italian food has earned them accolades in major publications like the New York Times, Wall Street Journal and GQ among others. In addition to amazing pizza, they have pasta dishes as well as appetizers, all made with 100% renewable energy. If you continue south on Flatbush Ave., you’ll run into Grand Army Plaza, which is the main entrance to Prospect Park. In addition to the iconic Soldiers and Sailors Arch, there’s also a JFK monument. Just past the arch is the Brooklyn Central Library with over one million books, magazines an, multimedia materials. Prospect Park is spread out over 585 acres. There are two â€œProspect Parkâ€ subway stops. The F-G line stops on the western corner and the B-Q (and S) line(s) on the eastern corner. 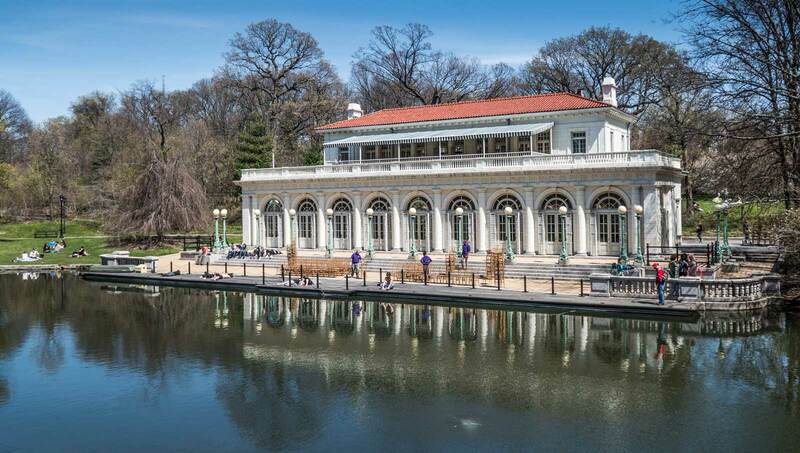 From the Prospect Park B-Q station, you can walk around Prospect Park Lake and meet back up with the B-Q train where you started, or catch it at Parkside Ave., east of Duck Island. Bike and boat rentals are also an option at the LeFrak Center at Lakeside. Every Sunday, Smorgasburg comes to Prospect Park. Ok, NYC is expensive. Everyone knows that, but $5 for a slice of pizza ($6 for a square)? And in a neighborhood most outsiders have never heard of? Well, DiFara has a typical wait time of at least an hour or two. On a quiet (by NYC standards) block outside the Avenue J stop on the Q line, other pizzerias often sit empty while there’s a constant line out the door at DiFara (including winter time). Fortunately, you can wait inside Fats Cafe and also eat there since seating inside the pizzeria is limited. Watching Dom DeMarco take his time can make you forget about the hustle and bustle of the city that never sleeps. The only tourists in this area are likely to be found at DiFara, and there are plenty of locals as well. A walk along Brighton Beach Ave. can make you forget you’re in the United States (well, ignore the elevated Q train on which you will likely arrive). Many signs are in Russian and you may not understand too many conversations going on around you if you don’t speak the language. However, this is an excellent opportunity to familiarize yourself with Russian food, whether you want to shop in a Russian store or sample one of the many restaurants along Brighton Beach Ave. and many of the side streets. Neighboring Sheepshead Bay is not to be ignored either. This area is home to more than 120,000 residents as has given us comedians like Andrew “Dice” Clay and Larry David as well as sports icons like Vince Lombardi and Lee Mazzilli. Since many people from the former Soviet Union have settled here (like in Brighton Beach), there’s an eclectic mix of restaurants to choose from. For Tajik food, try Cafe Dushanbe. When you’re finished, take a stroll across the Ocean Avenue Pedestrian Bridge, where you may see locals fishing in the bay. After you cross, turn in either direction onto Shore Blvd. and admire the multi-million dollar mansions. Ok, everyone has heard of Coney Island. The D-F-N-Q lines all end here and although more â€œexcitingâ€ amusement parks have been built all over the country in the more than 100 years since the three original iconic parks were built here, Luna Park is still an attraction. Thereâ€™s also the beach and boardwalk as well as the New York Aquarium. For baseball fans, the Brooklyn Cyclones have been playing at MCU Park (current name) since 2001 as the New York Mets single-A team. For foodies, thereâ€™s a Grimaldiâ€™s outside the subway (itâ€™s above ground there) station, but itâ€™s not the original and you wonâ€™t see a line outside the door. The real gem in this area is Totonnoâ€™s Pizzeria Napolitano. Theyâ€™ve been serving pies in Coney Island for over 90 years and have one of only a handful of coal-fired brick ovens still in use in NYC. Interested in Brooklyn food tours? This read is truly timely because I’ll be in Brooklyn this August! I’ll save this! Cool way of making your way around and maximizing transportation! My place of business is headquartered in NYC, so I travel there a lot for work. I was just talking with a coworker this morning about how I need to rethink my next trip and plan to stay for the weekend! i haven’t been to more than half of these places. I absolutely love your photos. I’m heading to NYC soon so this was very helpful, thanks for sharing! Brooklyn is so cool! That pizza looks delicious, I’m hungry now. I would love to visit Prospect Park. It looks so calm and relaxing. Oh boy, I’d go to Brooklyn just for the pizza! I never actually made it across the Brooklyn Bridge the last time I was in NYC. I’m putting it on my list for next time. I see you really like pizza! Haha I was just thinking about revisiting New York this summer and exploring anything but Time Square. Thank you for the list! This is awesome! Definitely going to be saving this for later! How timely! Will be in NYC in September and was thinking of bringing the kids to Coney Island. Keeping this for reference. I learned about Coney Island in my tourism classes. I’d love to make a visit there! Tourism classes? Tell me more! Great post on a rather unknown area of NYC! Love your blog! We have so many places in the US to visit (my boyfriend always wanted to visit the states:) , thank your sharing those spots in Brooklyn ! The Prospect Park seems lovely and damn he’d love those pizzas ! Also, Coney Island looks like a must visit ! Really handy you tell us about those spots according to the train stops. I need those pizzas. Next time I’m in New York I’m using this list! I miss New York Pizza!! Being from the West Coast though, I struggled with the lack of green outside of Central Park. Looks like I should have visited Prospect Park! I think my friend lives right near there and I visited her a few times, but I never quite made it there. The sight of that pizza made me salivate! Iissue NYC, this post made me reminisce a lot about The Big Apple! Wow, there are some really cool places in Brooklyn. There is so much of New York that I haven’t explored! I love this list! I’m definitely a huge fan of pizza so DiFara is something that I will go to for food as I stroll along the lovely places that Brooklyn has to offer. These are all great places to spend the day in especially with our kind of weather! Nice post! I’m a Brooklyn girl… well haven’t lived there since I was a kid but its great to see how it has changed through travelers’ eyes now that I don’t live stateside. Love the pics. Miss the pizza!!! Marissa, which pizzerias do you miss? Great pictures of Brooklyn! I just had my first chance to explore Brooklyn and loved it! What did you do there, Jamie? Love getting my ‘za on in New York! It’s a long drive from here, but there’s no sleep till Brooklyn. I have never EVER been in a car in NYC except for an accidental taxi. I love the concept of building an itinerary and eating schedule based on transit lines. And Coney Island is now and always will be cool. Brooklyn pizza is the best! 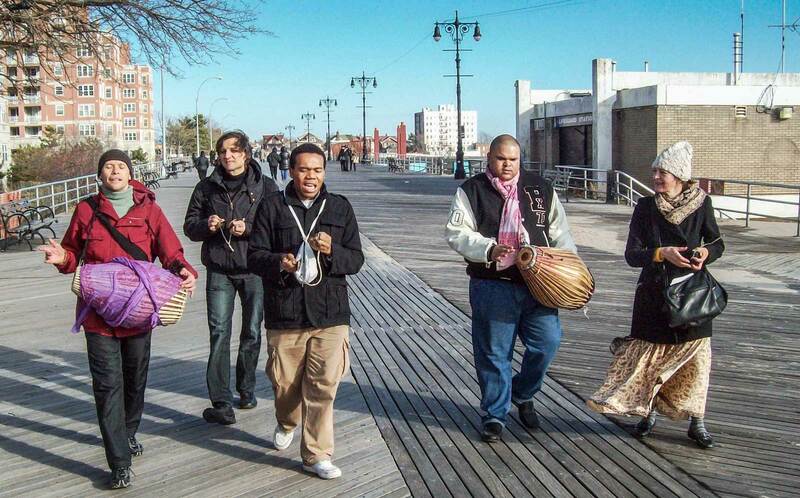 This looks like a great day trip to make next time we’re in NYC. I really want pizza right now! For me DiFara Pizza was the sole reason I visited the locality. unfortunately,Dom DeMarco was not there that particular time. for me he is like a god for Pizza religion 😛 . I wish I would be able to meet him next time. Well, I can show you around depending on when you can visit, Ana! I have never been to New York, although I do love riding trains around cities, best way to experience them! Where is your favorite public transit system? I loved your post. So many things I’d love to do .. pizza for lunch. A bike ride for a little exercise. Admittedly .. I’d have to do everything else before the library. I’m a sucker for books and would be lost for hours and hours. I used to work near Prospect Park. It is such a great place to hang! Cat, what do you think of my other choices? It looks like a great place to enjoy life ! This is awesome <3 Thank you for sharing! I haven’t been to New York yet. I live in Ireland and though we have plenty of pizza here I have a hunch it isn’t a patch on our friend the unstoppable Dom de Marco. Great photographs! There are an estimated 34.5 million Americans of Irish ancestry. I went on a food tour to Brooklyn with Sunny Anderson last year and went to DiFara Pizza. 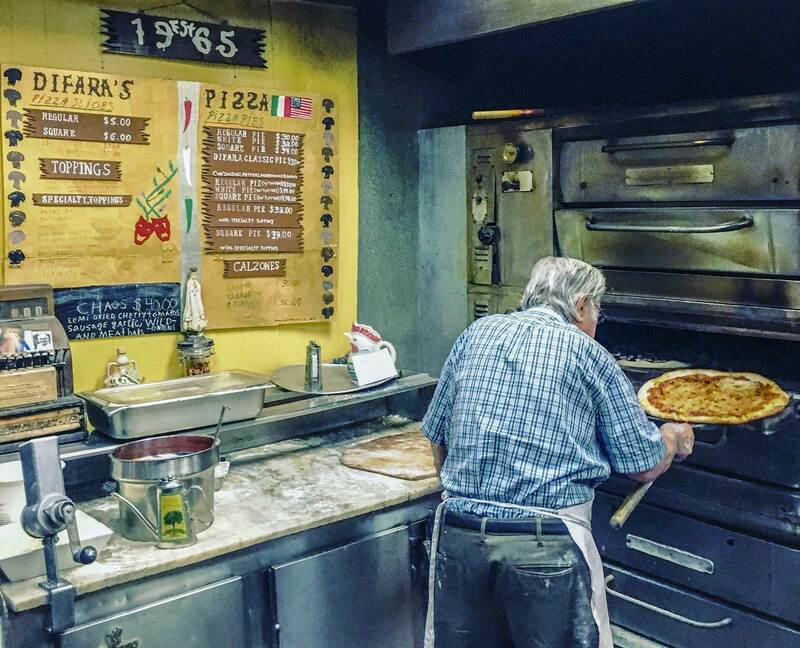 It was an overwhelming experience watching this old grandpa making pizza in his old fashioned oven with bare hands! Ana, how long were you at DiFara? Some great enticements to get out of Manhattan on our next visit. Thanks. Great suggestions. Never been to Coney Island. Next time I’m in New York, I may give your itinerary a try. Thanks for sharing. These places are so perfect, Brian! Thanks for giving me an idea for my next travel destination! Sometimes you don’t have to travel far to enjoy exploring. It’s amazing how you can explore so much by simply following a train line in Brooklyn! Coney Island looks so amazing. Reminds me of Santa Monica pier out here in California. When I make it back to NY I will definitely have to make a trip out to Coney Island.